I still can’t understand the phenomena of this cake. For me it’s a life-saver cake that uses leftover egg whites that always have too many. I needed to make this cake, as otherwise Tomek would ask me to move out, because we had like a ton of egg whites in the freezer. Other than that the cake is easy and simple. I would say an everyday cake. You just need a cup to measure ingredients, not even a standard size cup, just a cup. But I brought it to work and everybody loved it. I even got “It’s one of the best cakes I’ve ever eaten in my life”. 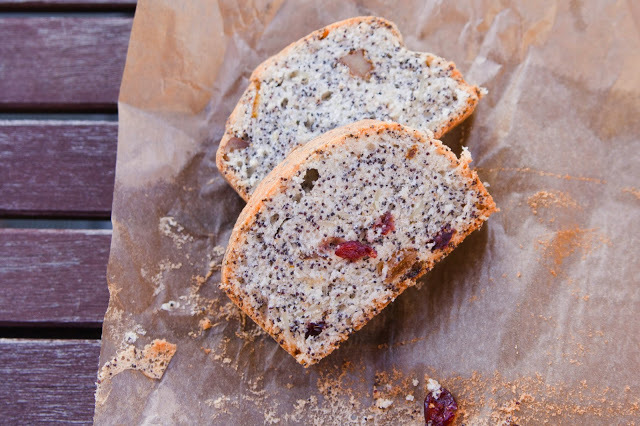 A few people mentioned they liked it for a poppyseed crunch in it. So if this cake looks tempting to you just try it, you won’t regret. Notes: I used half and half of black and white poppy seeds, just because I didn’t have enough black one. Add flour, poppy seeds, baking powder, walnuts, almonds, candied zest and melted butter and mix until combined. Line in a baking pan with baking paper. Pour the mixture into the pan, it should fill it up to 2/3 of the pan. Bake at 220ºC/200ºC fan for about 40 minutes or until a wooden stick comes out clean. When the cake gets golden cover it with a kitchen foil. Posted in Cakes, Polish food and tagged egg whites, eggs, poppy seeds. Bookmark the permalink. Love the name of that cake. Always good to have a recipe for using up egg whites – bane of my existence too! Lou, it’s one of the simplest I do, but it’s so handy when I have too many egg whites!